This place is a dump. Really bad food and the staff were terrible. Won't be visiting again! My boyfriend and I had a great experience at the bottomless brunch this morning. We booked our table for 11am as brunch is served between 11-1pm. The vibe was lively with a mix of groups and couples, and the staff were bubbly and helpful. I've been to a lot of bottomless brunches but particularly liked the way that this was a very informal brunch. Mimosas are made up in carafes so you can just take another once finished - beats having to wait for a waiter to bring another drink over. The added touch of unlimited toast and jam etc was also great as absorbed some of the alcohol . It's a bit out of the way if you are in central, but the perfect way to start the weekend for all us South Londoners! I love this pub, both its food and drinks are excellent; their Saturday brunch is a great thing to do. There is a lot of outside space, no garden but a lovely front patio area. Worth a visit and not too far behind the bustle of Lordship lane. The only reason for the 4* review, not 5 is that it took a short while to get served and the beer is pretty expensive. Great village local. We eat there quite a lot as the food is great. Lovely staff too. Great staff great food great place! And Sandy Toksvig drinks here! Great friendly atmosphere, warm welcome from staff and great drinks! 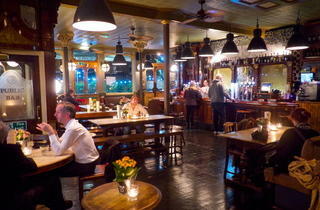 My awesome local; great food, great booze and the loveliest staff you could wish for. My favourite place in East Dulwich, possibly in London. The Great Exhibition is an amazing venue with something going on everyday! The food is awesome and there is always a different choice of ales. The Saturday brunch ROCKS and you are always in for a GREAT TIME! I recommend this little gem to everyone! Great people, beautiful venue, delicious food! All this in one place! great sunday roast with lovely live jazz! Warm, friendly staff, great management and a brilliant kitchen! Lovely little pub just off Lordship Lane. Good food, Nice bottles and Great Staff. Excellent pub, with a great atmosphere and fantastic staff! Best food pub in the area, always friendly service. Quiz is excellent, as is brunch. Evening meals are hit and miss but mostly hit, but the atmosphere is always great with friendly bar staff and reasonable prices. A great local pub, top food and lovely people. Some of the best brunch ever. Friendly staff and cozy atmosphere. Will be back. Love this Pub, such a great vibe. Great food, Great atmosphere and fantastic service. I love it here and so do my friends and family. Great pub with great staff and brilliant food. Their bottomless brunch is not to be missed! I don't know why the last reviewer doesn't like The Great Exhibition. I really do. It's a big place, with a smoking garden out the back and benches out the front in loads of residential roads in East Dulwich. It's not a swish pub machine, but it;s got character and there always seems to be music - jazz etc - on on Sunday evenings. They've got a great selection of beers and the food - especially the roasts on Sundays - is really good. The staff aren't always on the ball but they always seem really nice to me. 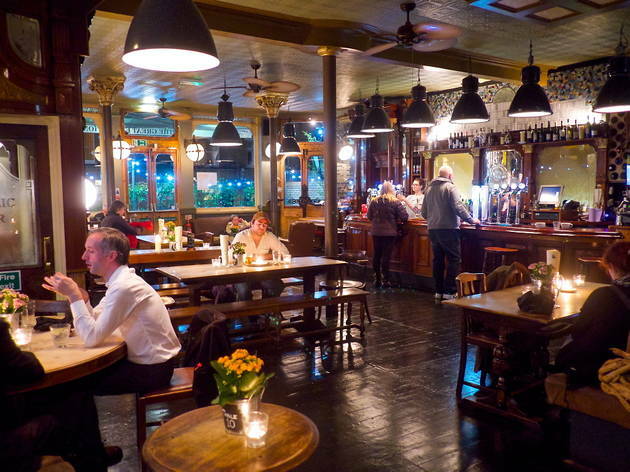 It's a classic London pub, relaxed, great atmospheric decor and excellent ales. What's not to like?